‘You will be the ones’ Mark Dantonio famously declared about the 2013 edition of the Michigan State Spartans. 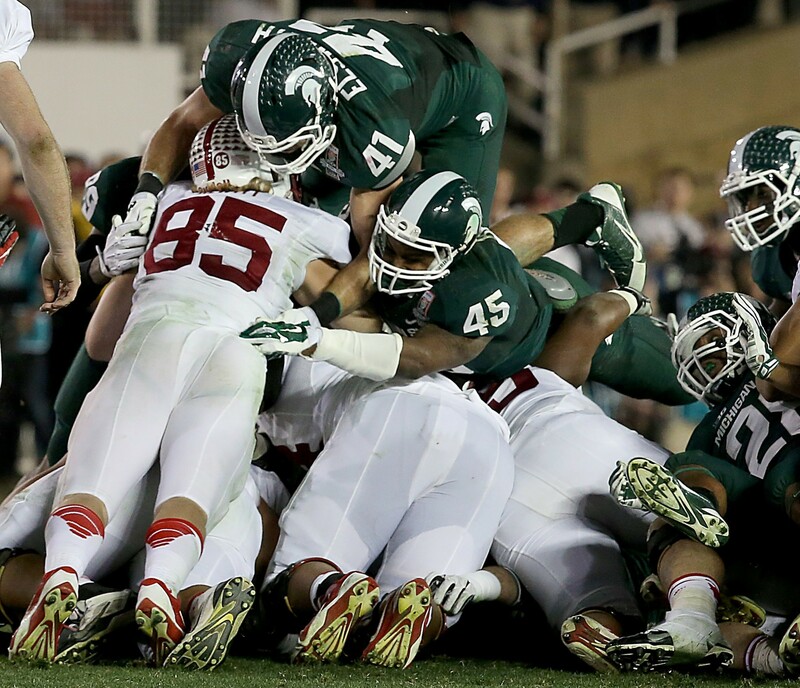 Never before had a Big Ten team won all of their games by at least ten points but the 2013 Spartans did that. That includes a 34-24 win over the Ohio State Buckeyes in the Big Ten championship. Mark Dantonio embodies everything that it means to be a Spartan. Along with Tom Izzo, he makes up 1/2 of the best football/basketball coaching tandem in America. Mark Dantonio came to an MSU program that had fallen on tough times, to put it politely. He made a point to prioritize the rivalry with Michigan. In his last ten, he is 8-2 against the Wolverines. Nowadays, the best in state come to State. The 2007 battle for the Paul Bunyan Trophy is infamously known for Michael Hart’s ‘little brother’ comments about MSU. This is where Dantonio endeared himself to Spartan fans. Pissed-off Dantonio put a stamp on the rivalry. More about this rivalry in a minute. Michigan State lost a ton of close games in 2012. An OT win over Wisconsin got MSU to bowl eligibility. MSU was not necessarily young but they had the talent to be good the next year. The best defense in the Big Ten brought back everyone for 2013. The linebackers and defensive backfield would headline a loaded Spartan defense. MSU fans had no idea who would start at QB or RB. The receiving corps was coming off of an unspectacular year. The defense was going to be elite again but whether or not this team was special would rely heavily on what the offense could do. Games against Western Michigan and South Florida were less than impressive. A 55-17 win over Youngstown State provided some optimism. Then Notre Dame happened. One of the worst-officiated games of all time resulted in the Spartans only loss on the season. Pass interference calls went against MSU all day. The Megaphone is still the only rivalry trophy that MSU does not currently hold. Not a whole lot to see here aside from two games. The MSU defense dominated Big Ten competition. Games against Iowa and Michigan were the turning points for MSU. Michigan State did enough on offense to compliment a strong defensive effort. Connor Cook finding his confidence as QB1 solidified the Spartan offense for the rest of the season. 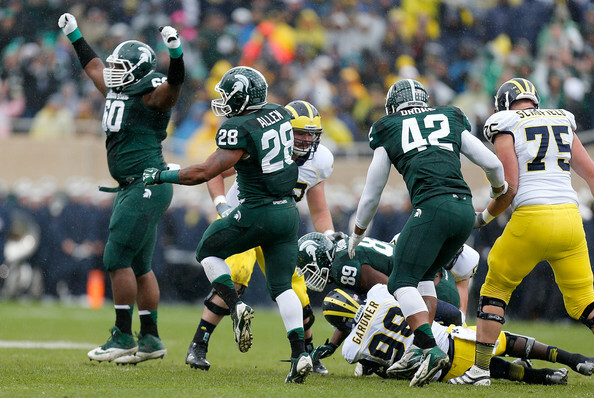 The Michigan game was all MSU needed to build confidence for the rest of the Big Ten season. The Spartans won 29-6 and massacred the Michigan offense all day. Taylor Lewan (world-class asshat) was dominated. Devin Gardner had to be carried off the field by his offensive linemen. Michigan State beat the piss out of Michigan. Michigan ran for negative (less than zero) 48 rushing yards. They failed to score a touchdown for the second year in a row. MSU took it to little sister that day. Beating Michigan in this manner absolutely let MSU know that they were the best team in the Big Ten not named Ohio State. Ohio State was one game away from the BCS championship. 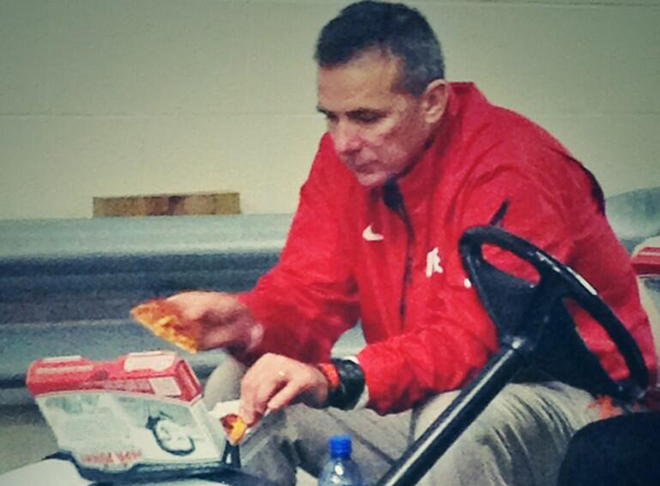 All Ohio State had to do was keep their 24-game win streak going. That didn’t happen. Michigan State won 34-24 with a phenomenal effort on both sides of the ball. The defense came to play down the stretch and Ohio State failed to convert when it mattered. MSU fell behind after building a 17-0 lead. But MSU rallied hard and made the stops when they had to. Ohio State made a 24-0 run after falling behind. MSU found two 17-0 runs and won their first Big Ten championship in the new title game era. Kyler Elsworth made the jump and brought MSU its first Rose Bowl championship in over 25 years. There isn’t much I can say about this game that hasn’t already been said. Kyler Elsworth helped fill in for suspended Max Bullough. He ended up taking home defensive MVP honors after some late-game heroics. Made me feel some type of way. Mr. CEO is what my title say.